Global recognition of the right to a healthy environment is long overdue. There are opportunities emerging to do so, and this would give crucial support to threatened environmental activists. 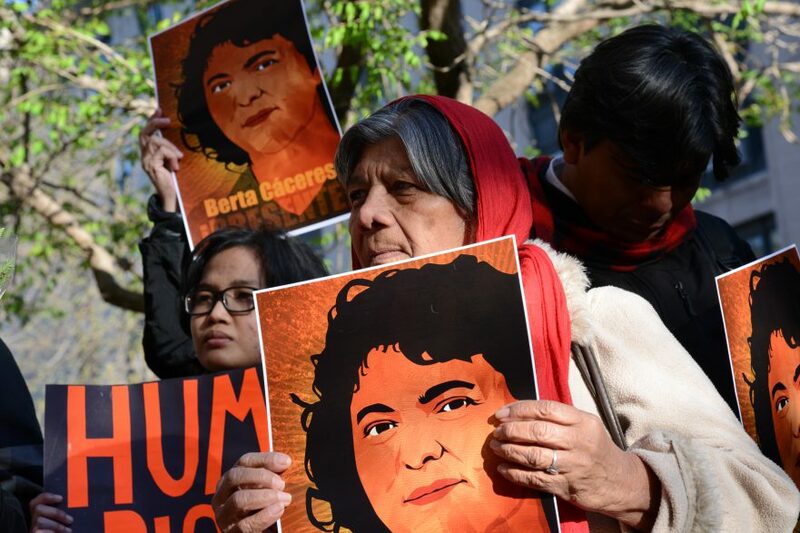 In March 2016, armed intruders battered down the door of the house where Honduran environmental activist Berta Cáceres, 44, was staying and killed her. By then, Cáceres, co-founder of the Council of Popular and Indigenous Organizations of Honduras, had spent years receiving death threats for her activities. She had been waging a successful grass-roots campaign against the Agua Zarca Dam project, a vast complex slated to be built by the Chinese state-owned company Sinohydro on land inhabited by the Lenca people. This is not an isolated case. People all over the world are mobilizing to protect the environment against deepening ecological crises, from rampant toxic pollution and climate change to deforestation, biodiversity loss, land degradation, and freshwater shortages. As the world’s natural resources face ever-greater exploitation, those who defend them against harmful mining, dams, logging, and agribusiness, are suffering direct violations of their rights. An increasing number are dying for their efforts. According to Global Witness, 2016 was the deadliest year on record, with at least 200 killings of environmental and land-rights activists documented in 24 countries, mostly in South America. Nearly 40 percent of those murdered were indigenous. Activists believe that companies or State forces are behind many of the assailants; few are ever arrested or even identified. Cáceres, and many others around the world have fought publicly and forcefully to protect their environments amid a deepening ecological crisis. Their deaths have thrown into sharp relief the need for accountability and redress for those who suffer most as a result of environmental harm: women, the poor, racial and ethnic minorities, and the young. But this violence also underscores the need to establish global recognition for the right to a healthy environment. Doing so could empower individuals and communities to defend their environments, providing a framework for holding offenders accountable and finding new legal arguments and recourse. The human right to a healthy environment brings together the environmental dimensions of civil, cultural, economic, political, and social rights, and protects the core elements of the natural environment that enable a life of dignity. Diverse ecosystems and clean water, air, and soils are indispensable for human health and security. The right also protects the civic space for individuals to engage in dialogue on environmental policy. Without it, government policies often cater to the commercial interests of the powerful, not the public, and certainly not the politically disenfranchised. Legal recognition has been expanding for decades at the national and regional levels. Since the UN Conference on the Human Environment in 1972, more than 100 countries have incorporated the right to a healthy environment into their national constitutions, in varying formulations. Certain regional human rights instruments also articulate the right to a healthy environment. The African Charter on Human and Peoples’ Rights, for example, recognises the right of peoples to ‘a general satisfactory environment favorable to their development.’ The Ogoni people in Nigeria’s Niger Delta have rallied around this right in their national and international advocacy against the harmful impact of oil exploitation on their lands and the abuses by the Nigerian military. The Ogoni’s efforts brought international attention to their cause—and their achievement suggests that a global movement to end impunity for the killings of local activists, such as Cáceres, could find success. A globally recognised right to a healthy environment should, of course, not be necessary to effectively protect individual environmental activists. Assaults against them violate a range of universally recognised human rights, including freedom of association and expression. But introducing this right could also anchor the work of environmental defenders — too often stigmatised as anti-development — squarely in the human rights framework. The legitimacy it confers could protect those persecuted for their activism. Windows of opportunity are opening for achieving recognition. As his term ends in 2018, John Knox, the UN Special Rapporteur on human rights and the environment, is preparing a synthesis of human rights obligations with respect to a healthy and sustainable environment. This work sets the stage for a fresh debate on the formal proclamation of the right to a healthy environment by the Human Rights Council or the General Assembly. Another opportunity is the Global Pact for the Environment, launched at the General Assembly by the French government. Much like the two international human rights Covenants from 1966 codified the Universal Declaration of Human Rights, the Global Pact is an attempt to codify the environmental rights and principles laid out in the seminal 1972 Stockholm Declaration on the Human Environment and the 1992 Rio Declaration on Environment and Development. The continued ecological viability of our planet has been called into question by scientists worldwide. Civil society organisations have consistently voiced the need to preserve the earth’s capability to sustain life, restore degraded ecosystems, and foster a balanced interaction between humans and nature. A fresh debate on the right to a healthy environment would increase awareness of how humans are not isolated from, but depend on, the natural world. The right to a healthy environment brings together all that humanity has learned about how human rights and the environment interact. It encompasses the environmental dimensions of the rights to life, health, food, water, sanitation, property, private life, culture, and non-discrimination, among others. It will give activists attacked for defending their environment and lands the tools and political leverage they need to defend their rights. As our generation faces serious environmental and social crises, the potential of the right to a healthy environment for progressive development and accountability cannot be understated. Its global recognition is long overdue. Marcos A. Orellana is director of the Environment and Human Rights Program at Human Rights Watch. Feature photo: Manifestación Berta Cáceres. Tras la audiencia sobre la situación de derechos humanos en el Bajo Aguán que tuvo lugar en la CIDH el 5 de abril de 2016, se realizó una vigilia en las puertas de la OEA por Berta Cáceres, asesinada el 3 de marzo de 2016 en Honduras. 5 April 2016. © Daniel Cima/CIDH under CC BY 2.0. This article first appeared on openGlobalRights, and has been reproduced with their kind permission.